I have been cloth diapering for over 2 years now with Evelyn. I started when she was 2 months old so she fit into her one size diapers then. I was going to wait to start with this little guy until he was about that old too but, I changed my mind and have decided to start a week or so after we get home. 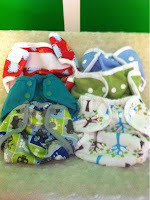 I have 2 packs of newborn disposables so I am thinking after I run out of those I will put him in cloth. 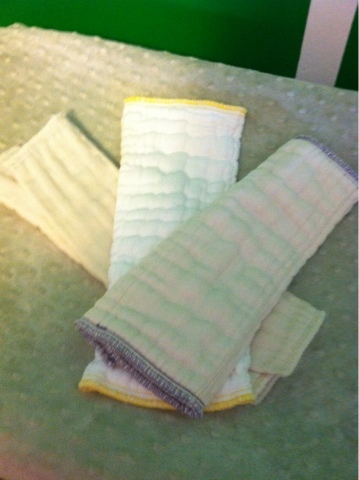 I bought a set of newborn diapers and oh they are so little and cute. I tried to be responsible and not go crazy on cute prints and extra's because I know he won't be in these for too long. I decided to go with pre folds and covers with a couple of fitted diapers. I choose 3 different types of pre folds. GMD yellow, Osocozy size 1, and osocozy perfect fit purple edge. For covers I choose 3 Thirstie Duo's size 1, 2 rumperooz newborn size and 1 Bummi's newborn size. For the fitteds I choose, a kissaluvs, a thirstie and a sandy's. These are a little big so they probably won't fit for a while but, I used a few fitteds with Evelyn at night time so I think these will come in handy later. 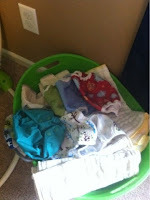 I am not sure how on board my family still is about cloth diapering. Mike still doesn't like it and I keep disposables in the house for him and for other people if they don't want to use cloth. I have really enjoyed it and I see how much better it is for Evelyn's skin and for the environment. We seem to go through so much trash as it is and I recycle everything I can. I can't imagine how much more trash we would have with at least 10-12 disposable diapers a day plus adding in a newborn who will go through more than that. I have 6 covers, and about 30 pre folds. I also bought another wet bag. 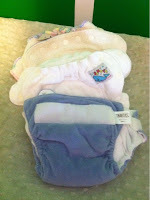 I already had snappi's and I already had 1 of the covers and 2 of the fitted diapers. So, all in all I probably spend a little over $100 for everything. I bought almost everything on sale and shopped around. You must be near where I live (we just moved from Bloomfield Hills to Rochester)! I found your blog through the bump, and I recognized your Detroit Zoo pics right away. I'm pregnant with #3 (due in Sept), and I'm planning to cloth diaper this little one. We've dabbled in cloth for the older two boys, but with this little man, I'm committed to it from the start. In the last year I've become a stay at home mom, so I feel like I have the time to take on this new endeavor. Thanks for the tips! I have given up, clothing wise that is.